Condoleezza Rice says Bush's policies will "stand the test of time"
Rice says she's not bothered by criticism; says she's "here to make tough choices"
Secretary of state says historians criticizing Bush "aren't very good historians"
(CNN) -- Secretary of State Condoleezza Rice said that despite President Bush's low approval ratings, people will soon "start to thank this president for what he's done." Secretary of State Condoleezza Rice says "there is no greater honor than to serve this country,"
"So we can sit here and talk about the long record, but what I would say to you is that this president has faced tougher circumstances than perhaps at any time since the end of World War II, and he has delivered policies that are going to stand the test of time," Rice said in an interview that aired on CBS' "Sunday Morning." The secretary of state brushed off reports that suggest the United States' image is suffering abroad. She praised the administration's ability to change the conversation in the Middle East. "This isn't a popularity contest. I'm sorry, it isn't. What the administration is responsible to do is to make good choices about Americans' interests and values in the long run -- not for today's headlines, but for history's judgment," she said. "When one looks at what we've been able to do in terms of changing the conversation in the Middle East about democracy and values, this administration will be judged well, and I'll wait for history's judgment and not today's headlines." Asked by CBS' Rita Braver why some former diplomats say Americans are disliked around the world, Rice said that's "just not true." "I know what U.S. policy has achieved. And so I don't know what diplomats you're talking to, but look at the record," she said. Rice said she wasn't bothered by criticism about her or the administration's polices, saying if a person in her business is not being criticized, "you're not doing something right." "I'm here to make tough choices, and this president is here to make tough choices, and we have. And yes, I -- there are some things that I would do very differently if I had it to do over again. You don't have that luxury. You have to make the choices and take the positions that you do at the time," she said. Asked about historians who say Bush is one of the worst presidents, Rice said those "aren't very good historians." "If you're making historical judgments before an administration is already out -- even out of office, and if you're trying to make historical judgments when the nature of the Middle East is still to be determined, and when one cannot yet judge the effects of decisions that this President has taken on what the Middle East will become -- I mean, for goodness' sakes, good historians are still writing books about George Washington. Good historians are certainly still writing books about Harry Truman," she said. 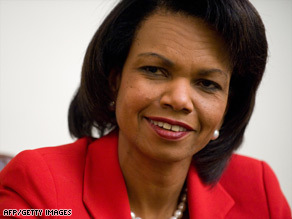 Rice, 54, said she has enjoyed working in the Bush administration during the last eight years, first as national security adviser, then as secretary of state. "There is no greater honor than to serve this country," she said, adding that there is also no greater challenge. Rice said when the new administration takes over, she plans to return to the Hoover Institution at Stanford University and write two books -- one on foreign policy and one about her parents.